The new linear questing system is great, but can lead to untold frustration when you wander into the wilderness, kill the enemies and return in triumph to find… you can’t find your next quest. You scour the city in search of a shiny exclamation point with despair. You backtrack to earlier camps, and venture into the wilderness seeking new encampments and no one will give you the time of day. A few short months ago, I would have directed the traveler to download Everyquest, a favorite addon for those seeking to finish Loremaster achievements, but alas, it seems to be out of date. However, I just found a replacement: Quest Completist. Like Everyquest, Quest Completist queries the server to discover which quests you have completed, abandoned, or never seen in order to give you the best possible idea WHERE you might need to head next. Unlike some other addons of this type, you do not have to have the addon operating from your character’s first days in order to keep track of your quest history — it’s able to do it for you from whenever you load it up! To get started, log in to your character and type /qc to bring up the interface menu. If you have played the character before, click the zones button, and select Server Query, found at the bottom of the menu. This updates your database. 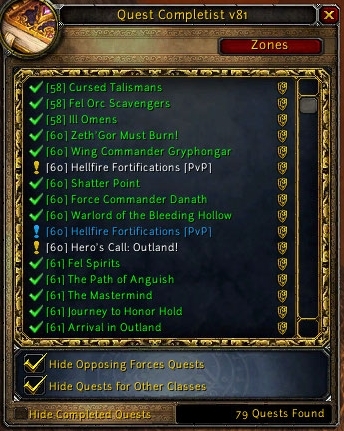 You can tell at a glance the status of your quests per zone. 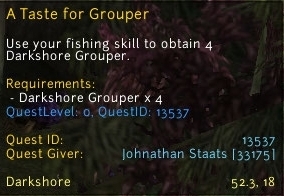 When hovering over a quest, a tooltip will appear with a large amount of useful information. So next time you’re bumbling around, lost, forlorn, and just knowing there’s another quest around the corner, don’t despair! Give Quest Completionist a try! Find it on Curse or WoWInterface. This entry was posted in Addons, Questing and tagged finding quest, missing quest, quest completist. Bookmark the permalink. Thanks for posting this – I've used EveryQuest til now, but it doesn't seem to be recovering from the Shattering… will check out Quest Completist tonight! oh! wow! now that is a handy addon. I have been struggling with my loremaster for a while. I got lost in Vashj'ir last night and just could not find quests. That, darlin, is truly awesome. Thank you!